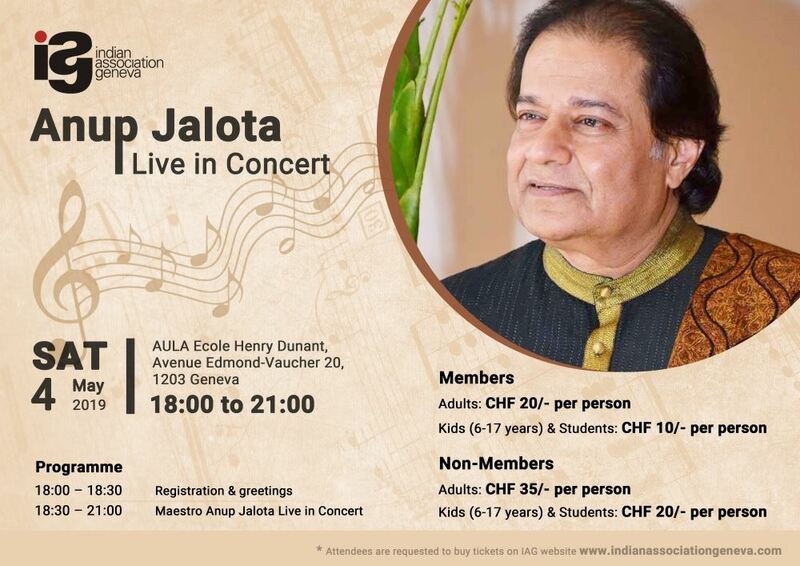 The Indian Association Geneva is excited to announce Maestro Anup Jalota in Geneva in May 2019. We invite you with friends and family to “Anup Jalota Live in Concert” to be held at Ecole Henry Dunant on Saturday, 04 May 2019 from 18:00 till 21:00 hrs. Maestro Anup Jalota needs no introduction, he is a well known singer and musician, known for his performances in Hindu devotional music, bhajan, the Urdu form of poetry, ghazal and Bollywood music. He is known as Bhajan Samraat" (Emperor of Bhajans) and was conferred with Padma Shri in 2012. Attendees are requested to buy tickets prior to event by clicking "Register" on IAG website. Extra-ordinary evening awaits you, come with family and friend. Please help us spreading this invite with friends and colleagues who would be interested for the gala evening with Maestro Anup Jalota.